He says, "a healthy environment is priceless beyond reckoning"
Editor's note: Carl Safina writes about how the ocean is changing and what it means for wildlife and for people. A MacArthur fellow, Pew fellow and Guggenheim fellow, he is adjunct professor at Stony Brook University and president of Blue Ocean Institute. His books include "Song for the Blue Ocean"; his upcoming book, "The View from Lazy Point: A Natural Year in an Unnatural World," will appear this fall. (CNN) -- In some ways, a catastrophe of this magnitude could not have happened in a worse place. Or at a worse time of year. We're hearing a lot about the economic dislocation of thousands of Gulf fishers and their families -- and rightly so. But the oil disaster is a much larger calamity than the Gulf itself. It's not just a regional disaster. It has hemispheric implications. Certain animals that normally inhabit the open Atlantic travel to the Gulf to breed. Two such species, both endangered, breed nowhere else. The world's most endangered sea turtle, the Kemp's ridley turtle, ranges throughout the west Atlantic as far north as New England. But it breeds only in the Gulf. Many are now heading there to lay their eggs on remote beaches. Turtles are showing up on beaches debilitated by oil. Oil kills sea turtles by both ingestion and direct toxicity, and by stressing and suppressing their immune systems. Adults are vulnerable, but hatchlings will have an even harder time. Atlantic bluefin tuna -- the most high-priced ocean fish in the world -- have declined by about 90 percent since the 1960s due to overfishing. Their west Atlantic population ranges the East Coast of the U.S. and Canada and far out to sea, but the Gulf of Mexico is the giant fish's only known breeding area. Spring is their breeding season. According to a web tool that puts the slick over your home region, the vast area of surface oil is now bigger than Massachusetts, Connecticut and Long Island combined. It overlaps the tracked movements of breeding bluefin tuna. Consequently, their eggs and larvae are presumably being bathed in a toxic soup of oil and dispersant. Dispersant, which is toxic by itself, also makes the petroleum more toxic. 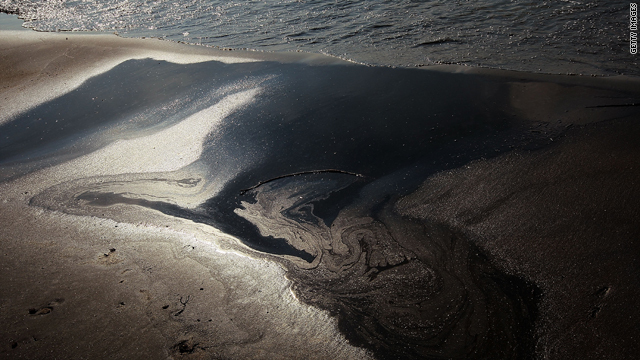 Instead of remaining concentrated at the surface, dispersed oil pollutes the entire water column. Instead of evaporating, the toxic components remain in the water. And because it's dissolved, it passes more easily across gills and into digestive systems. Planktonic animals become disoriented or die. Meanwhile, of course, mats of oil are washing ashore. No amount of boom will protect waterbirds like pelicans, gulls and terns, because diving into the water for fish is how they eat. In the Gulf in May, with the oil gushing, were loons, gannets, various kinds of herons and terns. Also there were black skimmers that had spent the winter there but would soon leave to migrate north and, depending on species, breed all along the coast from the southern states to as far north as the Maritimes, and lakes across much of Canada. Some of the longest-distance migrants on Earth are various sandpipers, plovers and other shorebirds, many of which winter as far south as Patagonia and breed as far north as the high arctic. Perhaps a million cross the Gulf in May, and when they reach the U.S. coastline, they must stop to rest and feed. Problems with habitat and food supply have reduced many of their populations 50 to 80 percent in the past 20 years. And now this. When oil was just starting to smudge some of the birds on beaches now thick with it, I saw sanderlings, ruddy turnstones, black-bellied plovers and other such northbound birds. Even among those that do not get heavily oiled, many will not make it. The birds' energy budgets operate on thin margins of food intake against exhaustive expenditure in long-distance flight. They will not bear the additional cost of feathers sticking and functioning inefficiently, and many such birds will drop out on their way north. Migrating peregrine falcons traveling north from South American wintering areas, destined for nesting areas as far as Greenland, are also crossing the Gulf's marshes. Preferentially picking off birds whose flight seems compromised, falcons will be getting disproportional doses of oil. All these birds can live decades and take years to mature, so adult birds killed by oil this year will mean populations reduced for years to come. This is a calamity not just in space but in time as well. Some animals may be rescued. Less possible to cleanse is the anguish on the faces and in the hearts of fishing families. Oil companies can drill, and they can buy votes in Congress, but apparently they can't do much else. Now that the reckoning is here, it becomes a little easier to see that we fool ourselves with the apparent cheapness of subsidized oil and that a healthy environment is priceless beyond reckoning. Why do we fail to know this always, in our bones? The Gulf is not a thing unto itself. Neither is the oil eruption. We are all Gulf victims now. The opinions expressed in this commentary are solely those of Carl Safina.